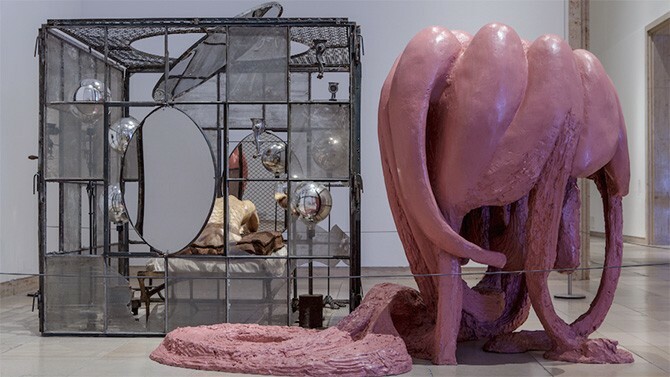 Garage Museum of Contemporary Art has recently opened the first comprehensive survey of Louise Bourgeois’ work in Moscow as part of the special program of the 6th Moscow Biennale. Structures of Existence: The Cells focuses on the extraordinary series of sculptural environments Bourgeois created in the last two decades of her life. Also included in the exhibition are the early sculptures, paintings, and drawings which led to the development of this monumental and innovative body of work. Coinciding with the show, Garage will present two large-scale sculptures: the monumental bronze spider Maman (1999) on the square in front of the Museum; and the international debut of Has the Day Invaded the Night or Has the Night Invaded the Day? (2007) as part of Garage’s Atrium Commission series. With a prolific career spanning seven decades—starting in the late 1930s in Paris and culminating in New York—Louise Bourgeois (1911–2010) is one of the few artists associated with both “modern” and “contemporary” sensibilities. Bourgeois began producing her first sculptural forms in the mid-1940s, and in 1949 she pioneered the concept of environmental installation in a solo exhibition at the Peridot Gallery in New York. Thirty-three years later, in 1982, Bourgeois had her first retrospective at the Museum of Modern Art in New York. She was 70. Around this time she also moved to a large studio space (in Brooklyn, New York), having used her Chelsea townhouse as a workplace for many years. This enabled Bourgeois to change the scale of her practice, giving rise to the Cell series, as well her spider sculptures, the first of which was made in 1994. To complement and expand on themes in the exhibition, Garage has collaborated with the Louise Bourgeois Trust and The Easton Foundation to present two large-scale installations: Maman (1999), a giant bronze spider towering more than 9 meters above the ground, will greet visitors in Gorky Park’s Garage Square before entering the Museum. Originally conceived as the inaugural commission for Tate Modern’s Turbine Hall in May 2000, Maman is one of the artist’s most ambitious and recognizable works to take the spider as its subject. First depicted in two of the artist’s drawings from the 1940s, the spider took on an even more dominant role in the artist’s practice during the 1990s. The largest in a series of spectacular sculptures created during the second half of the decade, Maman balances perilously above the ground on eight spindly legs, shielding a mesh sac containing ten marble eggs below her abdomen. Vulnerable yet predatory, the figure of the spider is a tribute to Bourgeois’ beloved mother. The artist explained, “Like spiders, my mother was very clever. Spiders are friendly presences that eat mosquitos. We know that mosquitos spread diseases and are therefore unwanted. So, spiders are helpful and protective, just like my mother.” Has the Day Invaded the Night or Has the Night Invaded the Day? (2007) is comprised of a giant, pivoting mirror standing over 6 meters high. The work’s title—taken from the artist’s diary entry on February 7, 1995—is projected onto the glass. Fascinated by mirrors as symbols of truth and self-knowledge, Bourgeois used them frequently in the Cell installations to bring the viewer directly into an environment. Placed in the Museum’s Entrance Hall, this larger-than-life mirror incorporates the visitor and the surrounding building into the world of the artist, while the reflected question introduces the perceptual nuances inherent to Bourgeois’ work. The exhibition and installations mark the first presentation of Bourgeois’ work in Moscow, but it is not the artist’s first exposure in (or with) Russia. She was twenty when she first visited Moscow in the summer of 1932. Her second trip was in spring 1934, when she attended the Moscow Theater Festival and experienced the May Day celebrations. This was also the year she started studying art intensively. Nearly 70 years later, in 2001, Bourgeois’ retrospective opened at the State Hermitage Museum in St. Petersburg. It was the institution’s first major exhibition of a living American artist. A Russian-language edition of the catalog for Louise Bourgeois. Structures of Existence: The Cells, published in English by Haus der Kunst and Prestel, will be produced to coincide with the exhibition at Garage. 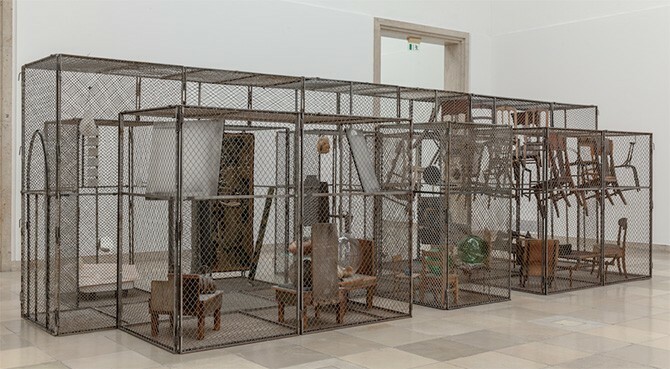 The exhibition is organised by Haus der Kunst, Munich in collaboration with Garage. Structures of Existence: The Cells is the largest presentation of this body of work to date and the exhibition is supported by Rosizo State Museum and Exhibition Center. Louise Bourgeois, In and Out, 1995. Metal, glass, plaster, fabric and plastic. Cell: 205.7 x 210.8 x 210.8 cm. Plastic: 195 x 170 x 290 cm. Collection The Easton Foundation. Photo: Maximilian Geuter © The Easton Foundation / RAO, Moscow. All rights reserved. Through the Looking Glass of Louise Bourgeois is a diverse set of activities intended to contextualize the artist’s extensive oeuvre. The program explores the wide-range of media used by Bourgeois to trigger audience perception and to expand understanding of her Cells as hybrid synesthetic forms. A series of lectures by local and international specialists, including Jerry Gorovoy, Kate Fowle, Julienne Lorz, Amei Wallach, Irina Nakhova, Olesya Turkina, and others, will reflect upon Bourgeois’ extensive career. Regular screenings of the film Louise Bourgeois: The Spider, the Mistress and the Tangerine (2008, directed by Wallach and Marion Cajori) will also take place throughout the exhibition in Garage Auditorium. Shot over more than a decade from 1993 until 2007, the film will acquaint audiences with Bourgeois’ captivating personality, providing insight into the artist’s thought processes as well as her practice in the studio. For families with children, Through the Looking Glass of Louise Bourgeois will focus on the medium of sculpture as an inimitable imaginative force that Bourgeois used to great effect. Skills will be developed during a series of open workshops on weekends and through a special children’s exhibition map, which is part of the city-wide program Family Trip: Take the Whole Family to a Museum! An audio guide, specially prepared for the exhibition and Atrium Commission, will be available in Russian and English, as well as special guided tours, including for audiences with special needs. Louise Bourgeois (b. 1911, Paris, France; d. 2010, New York, USA) lived and worked in New York, USA. Major solo exhibitions include: Louise Bourgeois: Retrospective, Museum of Modern Art, New York, USA, touring (1982–1984); Louise Bourgeois: A Retrospective Exhibition, Frankfurter Kunstverein, Frankfurt, Germany, touring (1989–1991); American Pavilion, 45th Venice Biennale, Venice, Italy (1993); Louise Bourgeois: Memory and Architecture, Museo Nacional Centro de Arte / Reina Sofia, Madrid, Spain (1999–2000); Louise Bourgeois: I Do, I Undo, I Redo, inaugural installation in the Turbine Hall, Tate Modern, London, UK (2000); Louise Bourgeois, Guggenheim Museum Bilbao, Spain (2001–2002); Louise Bourgeois at the Hermitage, The State Hermitage Museum, St. Petersburg, Russia, touring (2001–2003); Louise Bourgeois: The Insomnia Drawings, The Whitney Museum of American Art, New York, USA (2003); Louise Bourgeois: Retrospective, Tate Modern, London, UK, touring (2007–2009); Louise Bourgeois: The Return of the Repressed, Fundación PROA, Buenos Aires, Argentina, touring (2011); Louise Bourgeois, National Gallery of Canada, Ottawa, Canada (2011–2013); Louise Bourgeois: Conscious and Unconscious, Qatar Museums Authority, QMA Gallery, Katara, Doha, Qatar (2012); Sammlungshangung Bourgeois, Fondation Beyeler, Basel, Switzerland (2013–2014); Artist Rooms: Louise Bourgeois, A Woman without Secrets, Scottish National Gallery of Modern Art, Edinburgh, Scotland (2013–2014); Louise Bourgeois: Petite Maman, Museo del Palacio de Bellas Artes, Mexico City, Mexico (2013–2014); and Louise Bourgeois: I Have Been to Hell and Back, Moderna Museet, Stockholm, touring (2015). Awards and honors include: United States National Medal of Arts (1997) and the French Legion of Honor Medal (2008). Garage Museum of Contemporary Art is a place for people, art, and ideas to create history. Through an extensive program of exhibitions, events, education, research, and publishing, the institution reflects on current developments in Russian and international culture, creating opportunities for public dialogue, as well as the production of new work and ideas in Moscow. At the center of all these activities is the Museum’s collection, which is the first archive in the country related to the development of Russian contemporary art from the 1950s through the present. Garage Exhibitions spark engagement with art and culture while exploring issues of local and global relevance; Garage Education draws audiences of all ages through pioneering programs for both families and professionals; Garage Publishing makes major cultural texts available in Russian for the first time and innovates new publications related to Garage Archive, Exhibitions, and other activities; Garage Field Research invites practitioners to develop fresh perspectives on Russian art and culture; Garage Grants program supports young Russian artists and spearheads a range of activities that incorporate Russian artists into the global art community — all of which contribute to the Museum’s role as a multifaceted hub for arts and culture. Founded in 2008 by Dasha Zhukova, Garage is the first philanthropic organization in Russia to create a comprehensive public mandate for contemporary art and culture. Open seven days a week, it was initially housed in the renowned Bakhmetevsky Bus Garage in Moscow, designed by the Constructivist architect Konstantin Melnikov. In 2012 Garage relocated to a temporary pavilion in Gorky Park, specifically commissioned from award-winning architect Shigeru Ban. A year later, a purpose-built Education Center was opened next to the Pavilion. In June 2015, Garage moved to its first permanent home—a groundbreaking preservation project by Rem Koolhaas—that transforms the famous 1968 Vremena Goda (Seasons of the Year) Soviet Modernist restaurant in Gorky Park into a contemporary museum. Garage is a non-profit project of The IRIS Foundation. Garage Museum of Contemporary Art is situated in Gorky Park on the left side from the Central Alley. *Ticket price is subject to change. Please check the price before visiting by phone +7 (495) 645-05-20.